Of all the business disciplines that are involved with running a start-up, accounting is my weakest link. Even after more than a year at my business, even after buying the book Accounting for Non-Accountants and “reading” it during my time off last summer, I still struggle to understand depreciation and balance sheets. But I have a secret weapon – an accountant. 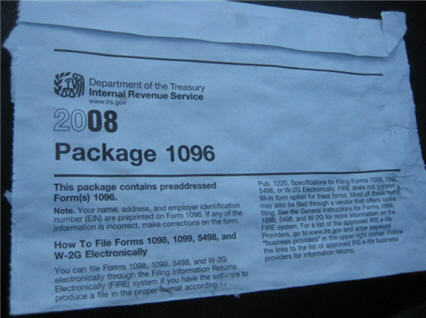 If you aren’t so lucky that you can drop off your tax forms to someone else to deal with, here’s a bit of information about Package 1096, along with a link to the IRS form (PDF).